Harley Quinn Spinsanity was actually a combination of two former Troika attractions that were removed from other parks. La Ronde had their Troika from 1976 until 2004 when it was removed for a new attraction. AstroWorld’s model, named Warp 2000, called the park home from 1981 until 2005 when AstroWorld closed down. 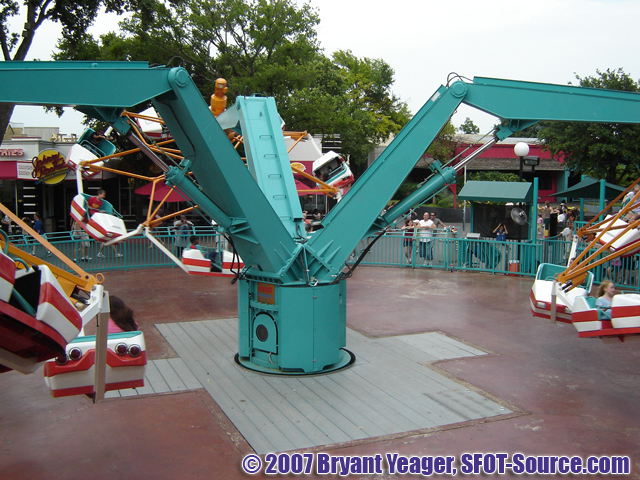 From 1973 through 1982, Six Flags Over Texas had a ride named Crazy Legs in the Good Time Square (known by this name until the 1989 season) section of the park. In 2006, for the park's 45th anniversary, Goodtimes Square received a piece of its history (the name, at least). The first version of Crazy Legs was a Eyerly Aircraft Monster. The second version was a Huss Troika that was made up of different pieces from various theme parks. In 2016, Crazy Legs would be renamed to Harley Quinn Spinsanity as part of the Gotham City expansion. Crazy Legs was dismantled and removed from Six Flags Over Texas in the winter of 2018 to make way for new restaurant development. 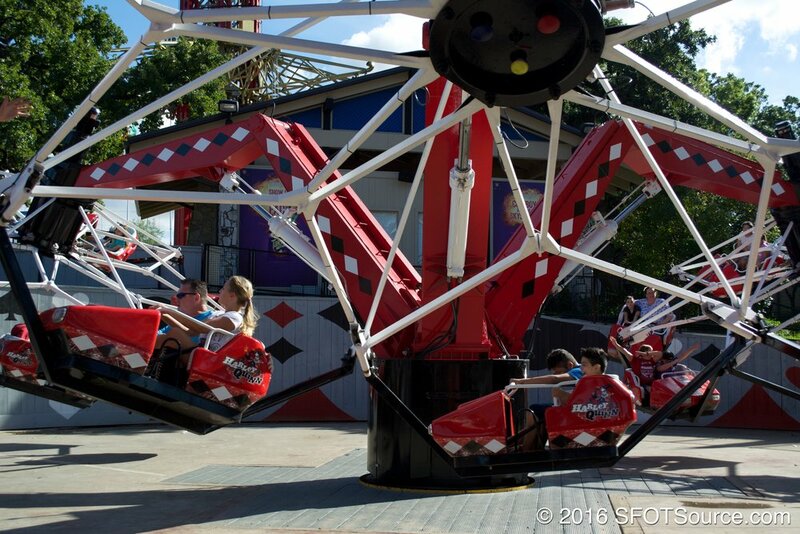 Crazy Legs is installed at Six Flags Over Texas. The attraction is made up of two different Troika models from AstroWorld and LaRonde. Crazy Legs is reconstructed with a new hub, star, carousel, and cars. Crazy Legs receives a new paint job: a orange and teal ride structure with red and white cars. 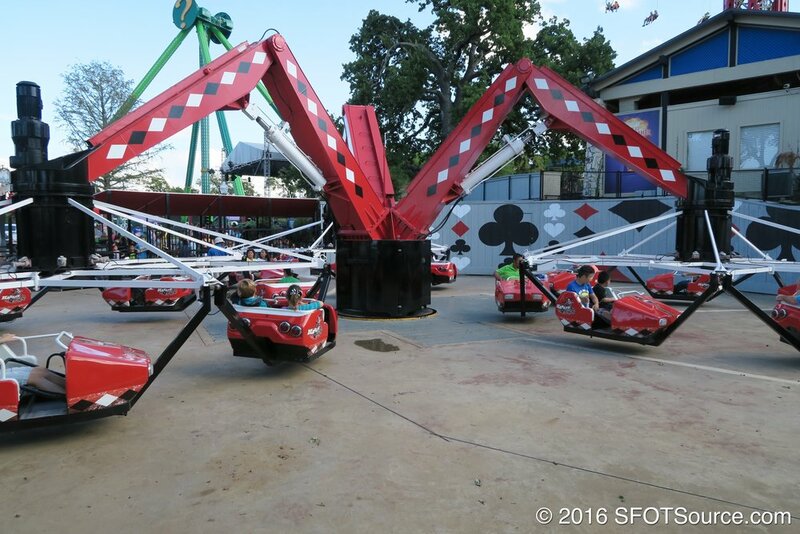 The ride was previously featured a silver ride structure with teal and red cars. Crazy Legs is repainted red, black, and white and renamed Harley Quinn Spinsanity.